I just would like to let you all know that our adoption of Ilse has been such a wonderful experience. 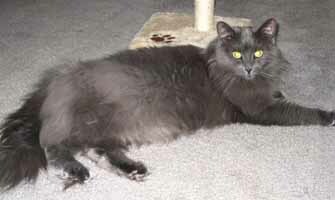 We lost both of our cats of 19 years each in the past two years and were a little hesitant on getting another cat. 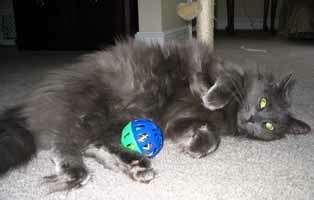 When we lost our Tasha this past November we were told of the cats available for adoption. After about 6 weeks of missing our girl we decided to have a look. The staff at Rockland have been great. I went to see Ilse one day and I knew she was the one. My husband was a little hesitant. I went to visit her again and as I sat down with her she came to me and put her paws on my chest and started nuzzling me. We took her home a week later and she has adapted to our house amazingly. You would think that she has always lived with us. Our first night she slept on me most of the night and follows us around all the time. We have no problems whatsoever with her and couldn't be happier with her. She is a special cat and has so much love to give us. Thanks to everyone and we will keep you posted on our special girl.